As the dim sum cart rolls away from the table and the final drops of tea have been poured, we are often left wishing we had savored that one last bite that is now a mere flavor memory. For me, that dim sum craving is steamed buns. 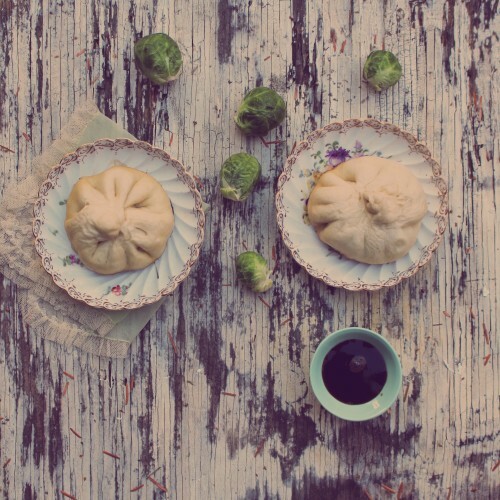 In hopes of indulging in the last sip of tea and steamed bun in the comfort of my kitchen, I created a recipe that infused the tea into the steamed bun in both the filling and in the steaming liquid. And there’s no need for a steamer basket, as these buns are steamed in your go-to skillet or saucepan. While this recipe calls for the warming toasted notes of a slow-roasted Japanese hojicha green tea, you can also swap in the earthy pu-erh that is often served at the end of dim sum meals to aid in digestion and cleanse the palate. For a gentler flavor, opt for the nutty hojicha, intended to balance the flavors in the filling and broth rather than be the star of the show. The tea makes its way into the recipe as a dry ingredient in the filling, after ground in a spice grinder as dry leaf (note that if a spice grinder isn’t in your kitchen collection you can use a food processor as well). Where the hojicha flavor will truly shine (and add aromatics in your kitchen) is when you infuse it into the broth that will be used to steam the buns. The nutty notes of the roasted hojicha add delicate toasted flavors that effortlessly mingle with the toasted sesame oil found in both the dough and the filling. Keep in mind that when any recipe calls for broth or water, there is always an opportunity to infuse it with tea to either balance or amplify flavors. Keep in mind that when any recipe calls for broth or water, there is always an opportunity to infuse it with tea to either balance or amplify flavors. While the ingredient list may seem daunting, this recipe was created to not only explore an Americanized twist on the steamed bun filling, but also offer a way to repurpose leftover roasted meat and mashed/cooked sweet potatoes. Think of the filling as a Sunday dinner of roasted meats and vegetables combined with Asian flavors, tucked into a tiny dough pouch. Considering that the dough needs to rest for an hour, use that as a time to explore the taste of hojicha by brewing a pot of the tea. Be sure to reserve a final cup to pair with the steamed buns the moment that they move from pan to plate. The roasted hojicha sips and piping hot steamed buns will surely warm you up on a chilled spring day. In a small pot over low heat, heat the milk and oil until just warm. Pour into a small bowl, sprinkle the yeast on top, and let it rest for ten minutes. While the yeast rests sift the salt, sugar, and flour in a medium bowl. Drizzle the yeast, milk, and oil mixture slowly into the dry ingredients, all while mixing with a spatula. Knead the dough until it comes together (approximately twenty seconds). Sprinkle your work surface with flour and knead the dough for ten minutes (until smooth). Shape the dough into a ball. Clean and dry the bowl used to mix the dough, and lightly grease it with toasted sesame oil. Place the dough in the greased bowl, cover it with a damp towel, and let it sit for one hour at room temperature (note: the dough will double in size). As the dough rises, make your filling. Bring a small pot of water to a boil, add your sliced sweet potatoes, and boil for ten minutes. Strain out the potatoes and mash then in a medium bowl. Mix in your hoisin sauce, toasted sesame oil, rice vinegar, salt, ground hojicha tea, soy sauce, garlic, green onions, brussels sprouts, and roast chicken. Cover and refrigerate until ready to use. Next, make your tea-infused chicken stock that will be used to steam the buns. In the same small pot used to warm the milk, heat the chicken stock to 180 degrees, lower the heat, mix in the hojicha tea, and steep for four minutes. Strain out the tea leaves and reserve the tea-infused stock. Once the dough has finishing rising, punch it down, place it onto a floured surface, and knead for ten seconds (note: if the dough feels too wet or sticky add a touch more flour). Pinch off small pieces of dough (the size of a golf ball), flatten the dough balls between your palms, and then roll it into a flat circle (approximately five inches in diameter). Place a tablespoon of the filling in the middle of the dough and fold the dough up around it (pinch and pleat to seal the dough). As you finish each bun, place on a baking sheet and cover with a damp towel to prevent the buns from drying out. In a large sauté pan, heat two tablespoons of vegetable oil over medium heat. Carefully place the buns in the oil (pleated side up) and sear for three minutes until the bottom of the buns are golden brown. Pour in the tea infused chicken stock, bring to a boil, reduce the heat to a simmer, slightly cover (leaving room for steam to vent) and steam for twenty minutes over medium low heat. Once you hear a sizzling sound and all of the tea infused stock has evaporated, cook for one minute to add crisp texture to the bottom. Serve immediately with dipping sauce. —Recipe and photo by Alexis Siemons.